If you own a Saw Stop brand Table Saw, you will have no need for the magnifying glasses on either side of the saw fence. When you measure a nick in your material you will be able to confidently bring the fence into size by dialing the hex knob in or out. Experienced operators use both sides of their Biesemeyer fence T-square; the Micro-Adjuster is ambidextrous. end-users can employ two or more Micro-Adjusters to allow for multiple precise cutting coordinates with minimal adjustment time. Custom Fabricating Solutions (LLC) gladly presents its first product: the Micro-Adjuster® for a table saw fence (or router table). This piece is meant for table rails with a thickness of .75" to 2", though it can be machined to size for other tables. Specifically engineered for commercial Biesemeyer-style T-square fences, this added accessory allows operators to dial in the exact cutting coordinate needed. We found that most people can set up a fence quickly or precisely: this allows nearly everyone to accomplish both parameters reliably and with repeatably. Though other designs and other products are available, we haven't encountered another adjuster as practical as ours which can still stand up to the rigors of an industrial/commercial environment, as well as afford an operator such consistently accurate control. We often find that we need to bring our material gradually in to size. Sometimes this material is expensive, so we can't afford to make mistakes. When we need to trim in terms of thousandths, this system has made cutting much more efficient: fewer man-hours spent with less material wasted. In our experience, our Micro-Adjuster is the best and most practical mechanically calibrated fence adjuster currently on the market. 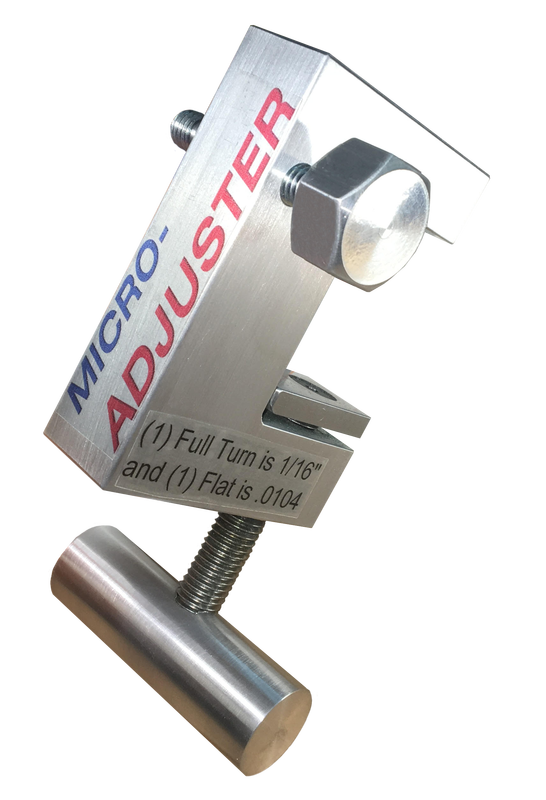 Move the adjustment point one flat and you can move your fence 0.010"
Clamp Space = 3/4 - 2"
This Micro-Adjuster is specifically engineered for commercial Biesemeyer-style T-square table saw fences, but it can be used for router tables and other adjusting jobs. This added accessory allows operators to dial in their cutting coordinate, allowing for precise adjustments. Though other designs and other products are available, we haven't encountered another adjuster as practical as ours which can still stand up to the rigors of an industrial/commercial environment, as well as afford an operator such consistently accurate control. is machined from one-piece billet aluminum, with the moving parts made from stainless steel and black oxide. The T-handle and adjustment knob, also of billet aluminum, give the user an ergonomic and solid grip on the task at hand, with the wear resistance of 1018 billet steel used for the pressure plate. These materials give the Micro-Adjuster strength without adding unnecessary weight, and will provide years of robustness. We are proud to say that all of our material--with the possible exception of the set screws--as well as our machining and assembly is produced and made in America. It has been engineered to meet and exceed the demands of commercial use. Though other designs are available, we haven't encountered another adjuster as practical as ours which can still stand up to the rigors of an industrial/commercial environment, as well as afford an operator such consistently accurate control.